In 2013, the CCAA Advisory Board created its first endowed scholarship to assist Columbia College students to commemorate 50 years of serving alumni worldwide. The CCAA Scholars Program benefits students who exhibit notable affinity for Columbia College. 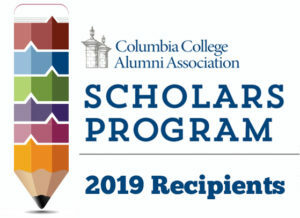 Students of the all Columbia College programs — Day, Evening, Nationwide locations and/or Online Education — are eligible to apply, and recipients may use the scholarship toward tuition, books or room fees. Meet this year’s CCAA Scholars recipients.